Nobody wants to wake up one day and notice crow’s feet around their eyes. There was a time when wrinkles were considered as a sign of aging. But, nowadays, it is no longer a surprise if they start appearing even if you are in your mid-20s. Hectic lifestyle, stress, lack of sleep, and improper diet often lead to skin damage, essentially resulting in wrinkles. The minute you start noticing wrinkles and fine lines, you look out for methods to get rid of them. You do not want to go under the knife nor get the celeb-favored botox treatments done. There are many natural and homemade solutions available. By using these methods, not only the younger generation, but even the elderly can make their skin look healthier and younger. The solutions are inexpensive and simple to follow. The best part is that these home remedies for wrinkles have minimum to zero side effects. But, before we discuss the solutions, let us first understand what wrinkles are and what causes them. Keep reading to know more. Wrinkles are also known as rhytides. They are creases in the skin that become pronounced with aging as the skin loses its natural elasticity. What Causes Wrinkles on Skin? The skin on the face is the most sensitive and thin when compared to the rest of the body. Hence, wrinkles on the face are quite common. Wrinkles around the eyes, on the forehead, and laugh lines or wrinkles around the mouth are very common. 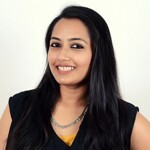 Neck wrinkles are also seen where the skin also tends to start sagging with age. Wrinkles on the chest, hands, and feet also develop in time. Massage coconut oil under the eyes and other affected areas for a few minutes. Use gentle circular motions. Coconut oil will give your skin a natural glow and radiance. 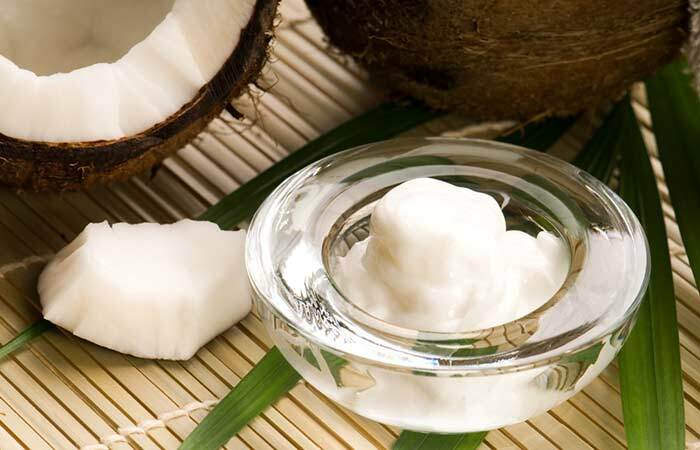 Using it often will help to fade wrinkles and lines as coconut oil is moisturizing and hydrating for the skin. It restores the skin’s elasticity to a great extent (3). Use a cotton ball to apply castor oil on the affected areas. Do not rinse the oil. Keep it on overnight. Apart from being an emollient, castor oil enhances the production of elastin and collagen in the skin. As a result of this, the wrinkles and fine lines start to diminish and even disappear over time (4). Leave it on for as long as you can and then wash off. A few re-runs over the next few weeks, and your skin will be supple and wrinkle-free. A grape could drape your wrinkles! The seed of this little fruit will help to tighten your skin and impart a healthy glow to it. 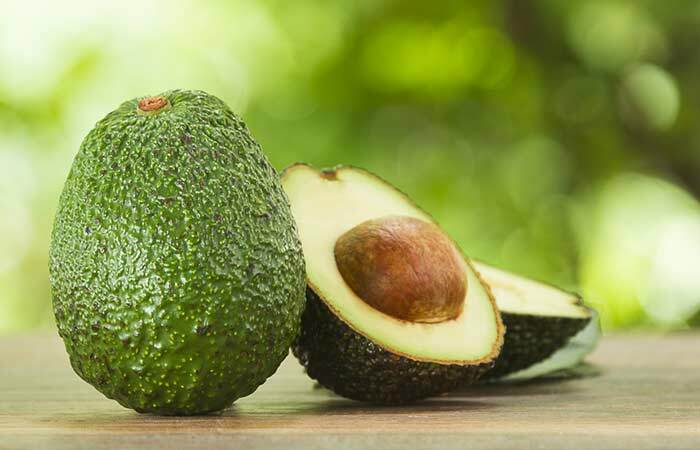 It does this by supplying the skin with fatty acids, polyphenols, and vitamin E (5). Pierce the capsule and pour the oil present inside into a small bowl. Open as many as capsules as required to cover the affected area. Apply this oil and massage the area for a few minutes. This is best done every night before going to bed. Vitamin E is known to moisturize and refresh your skin with its skin hydrating property and antioxidants. It also has anti-inflammatory and photoprotective effects on the skin. This renews the skin’s vigor and diminishes wrinkles (6, 7). Massage the affected area with argan oil. Leave it on. 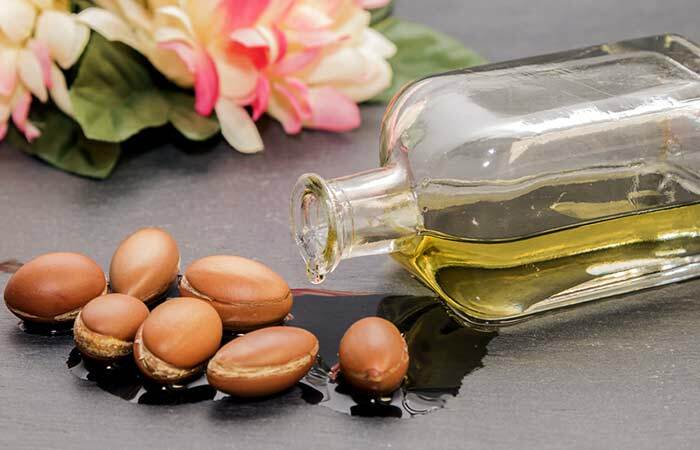 Argan oil is easily absorbed into the skin. It contains a high amount of essential fatty acids and vitamin E that replenish the skin. Its regular usage will reduce wrinkles and fine lines (8). Mix the vinegar and honey and apply this mixture on your face and neck. Apply a moisturizer that suits your skin type. The pH balancing property of apple cider vinegar, along with healing properties of honey, will make your skin glow with a youthful appearance (9). Apply a thin layer of Vaseline on the affected area. Massage for a few minutes so that it is easily absorbed. Do this every night before going to bed, and you will start noticing results soon. 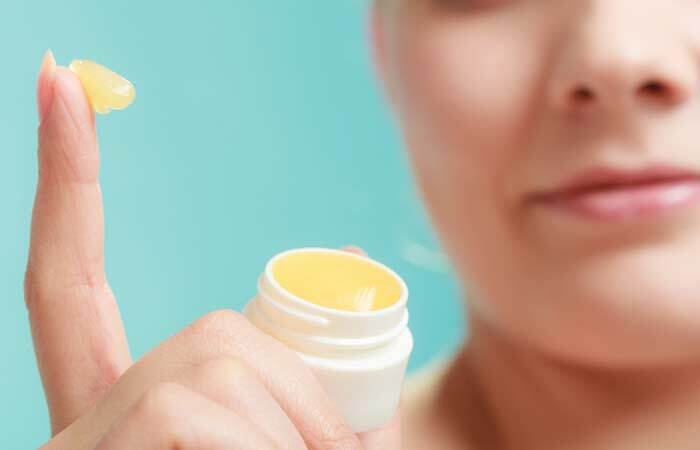 Using petroleum jelly for wrinkles is a remedy loved even by celebrities. It is an occlusive agent, which means that it locks in moisture in the skin (10). The exact mechanism of how petrolatum diminishes and prevents wrinkles is still unclear, but there is no harm in trying this remedy as petroleum jelly is safe to use topically. Do not use this remedy if you have acne-prone skin. Gently whisk the egg white and apply it on your skin. Allow it to dry completely. Rinse it off with lukewarm water. Instead of trying out those anti-wrinkle creams, reach out for egg whites. Wrinkles and sagged skin will soon be a thing of the past with this simple home remedy. The egg whites tighten your skin naturally, easing fine lines and laugh lines. This remedy is especially good for people with oily skin as egg white also unclogs pores and absorbs the excess sebum from the skin (11). Peel and remove the pit of the fruit. Mash the pulp to get a smooth paste. Apply this on the skin for 20-30 minutes before you step into the shower. Have you ever checked out the ingredients of your favorite natural anti-wrinkle cream? You are bound to see avocado in it. This fruit is a blessing for those with premature wrinkles. Along with halting premature aging, it reduces wrinkles and pampers your skin back to health. Your skin will glow with radiance and vitality (12). Make a paste of these two ingredients and gently massage it on your face. You can also apply aloe vera gel by itself. Aloe vera gel is an enriched source of vitamin E, which is a booster for the skin and works excellently in combination with egg whites. Aloe vera also heals dull skin with its antioxidants and anti-inflammatory compounds (13). This one is yet another home remedy for wrinkle-free skin that is simply fail proof. 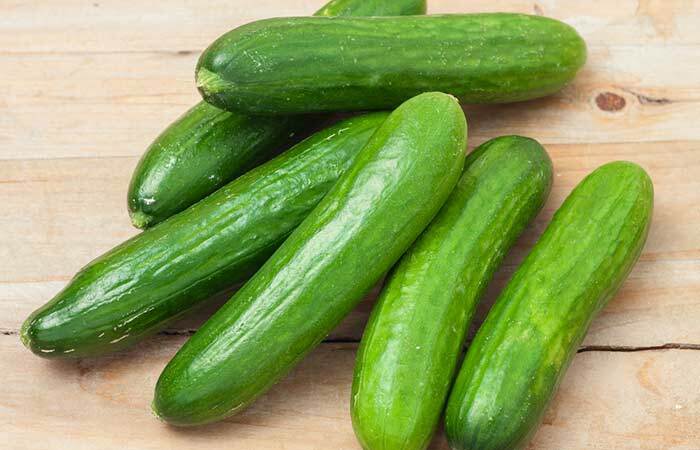 Cucumber contains 95% water and many minerals and vitamins. Within a few applications, you will see that the wrinkles and dark circles have visibly reduced (14). Apply honey on your skin and massage for a minute or so. Leave it on for a half an hour and then rinse with lukewarm water. You can also shred a small piece of ginger and add it to the honey for added benefits. Do this every day for healthy and youthful skin. Heavy work really tells on your eyes, and with age, they get wrinkles and look very tired. Counter this by applying best quality bee’s honey around the skin of your eyes. It balances the skin’s pH and conditions it to decrease the appearance of wrinkles and fine lines (15). Apply the oil on your face and massage until it is absorbed. This essential oil is excellent for deep wrinkles and other signs of premature aging. The Duchess of Cambridge swears by the anti-aging effects of this oil. The vitamin A, vitamin E, and fatty acids present in it penetrate into the deeper layers of skin and lighten scars and banish wrinkles (16). Apply the mixture on your face and neck. Let it dry for 10 minutes. Lemon juice is not just useful to quench your thirst during the summer, but you can use it as part of your beauty treatment as well. Its vitamin C content helps in rebuilding collagen in the skin, which in turn fades away wrinkles and fine lines (17). Massage the affected area with shea butter using gentle circular motions. This is best done every day after taking a shower. 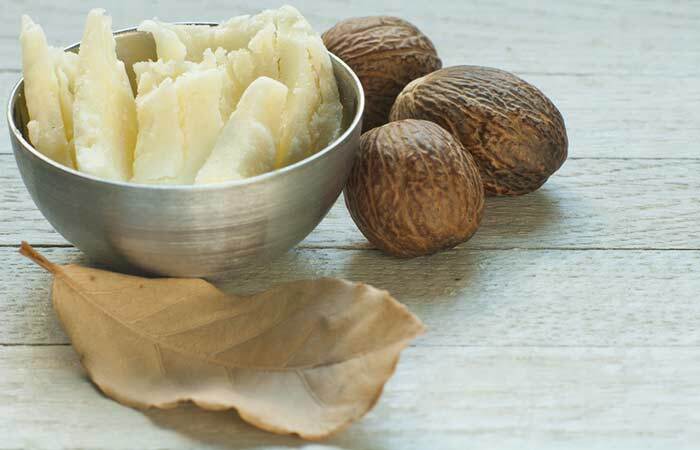 Shea butter is extremely hydrating for the skin. It improves the elasticity of the skin and also promotes collagen synthesis (18). Apply a few drops of jojoba oil on your face. Massage gently. Do this every day for wrinkle-free skin. Jojoba oil is quite similar to the natural oil produced by the skin. It gets easily absorbed into the skin and lubricates it. With regular use, fine lines and wrinkles are reduced (19). Make a paste with the turmeric powder and sugarcane juice. Mix well so that there are no lumps. Apply this and leave it on for 10-12 minutes. Turmeric and sugarcane will synergically slow down the loosening of skin. Sugarcane juice contains glycolic acid that removes dead skin cells and turmeric possesses healing properties that rejuvenate the skin (20). Use turmeric powder that is meant to be used topically as this stains less. 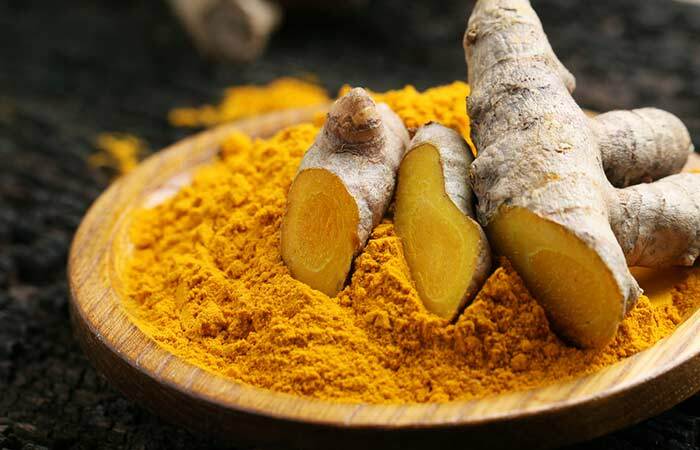 Turmeric used for cooking purposes will leave yellow stains on your skin that will be difficult to remove. Make a blend of both the oils and apply it to the affected area. Do not rinse it off for at least a few hours. You can do this before going to bed every night. 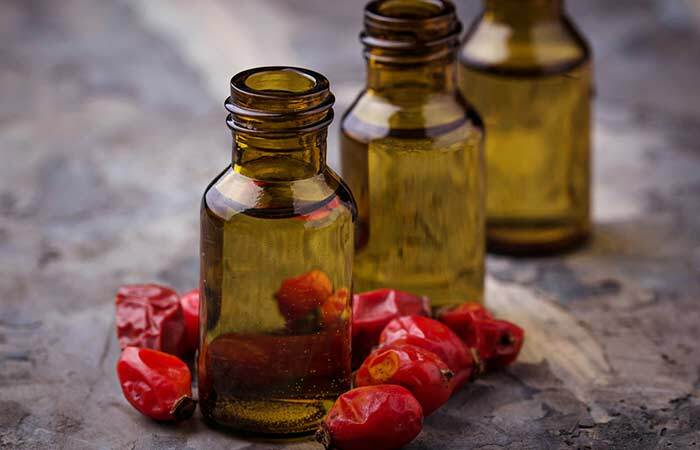 Widely used in the Middle East and Southeast Asia for its healing properties, black seed oil or kalonji oil contains a rich variety of phytochemicals that are beneficial for the body and skin. Its unsaturated fatty acids, like linoleic acid and oleic acid, moisturize the skin. The antioxidants present in it reverse the damage caused by oxidative stress (21). 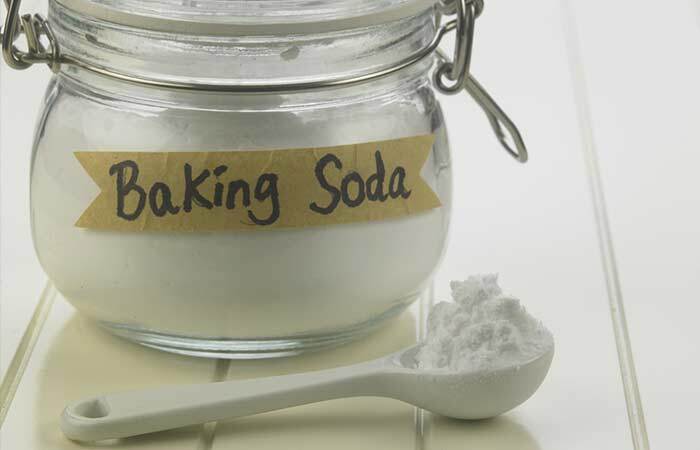 Make a baking soda paste and use it to scrub the affected areas gently. Scrub for a few minutes in circular motions. You can also apply the baking soda paste as a mask and let it dry for about 10 minutes before rinsing it off. Baking soda mask or scrub can be used twice a week. Baking soda is an exfoliating product that removes dead cells and also any impurities that have accumulated in your pores. It improves the cell turnover and blood circulation, which help in reducing wrinkles (22). This home remedy can leave your skin a little dry. Do not forget moisturize the skin after this. Mix the honey and cinnamon and apply this mixture as a mask. The cinnamon paste and honey combo is a great anti-aging mask. Cinnamon’s free radical scavenging activity is further enhanced by honey. They both possess anti-inflammatory and antimicrobial properties (23). Honey is also an emollient (15). Cinnamon can be irritating for certain skin types. Do a patch test before using it. Brew some fresh green tea by steeping the tea bag in hot water for a couple of minutes. Add honey to taste. Drink while the tea is warm. Sip on 2-3 cups of green tea in a day. Did you ever laugh at those several dozens of people who sipped on green tea while you were relishing a hot cup of Joe? The next time you are tempted to laugh at someone who has a mug of green tea, pause, and look at his or her skin. You will be astounded how radiant and glowing they look. 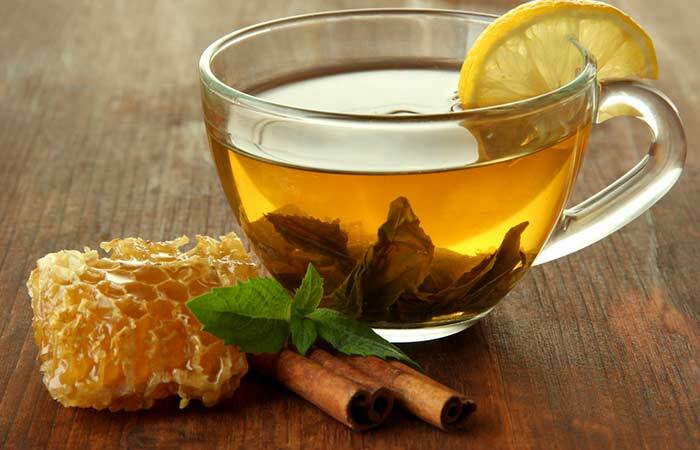 Green tea is loaded with antioxidants that help in cleansing the body, reducing wrinkles and sagging of the skin (24). Purée the two fruits together and apply the paste on those fine lines on your forehead. Leave it on for 15-20 minutes and then rinse with lukewarm water. Use this fruit mask once or twice a week. Papaya is loaded with enzymes such as papain, while banana is rich in vitamins that help in revitalizing your skin. This pulp is a good antidote for premature aging signs (25, 26). Mix the olive oil and yogurt. Beat the mixture gently so that the oil is completely blended with the yogurt. Apply this on your face and neck. Leave it on for 20 minutes. Repeat the application of this mask twice a week. 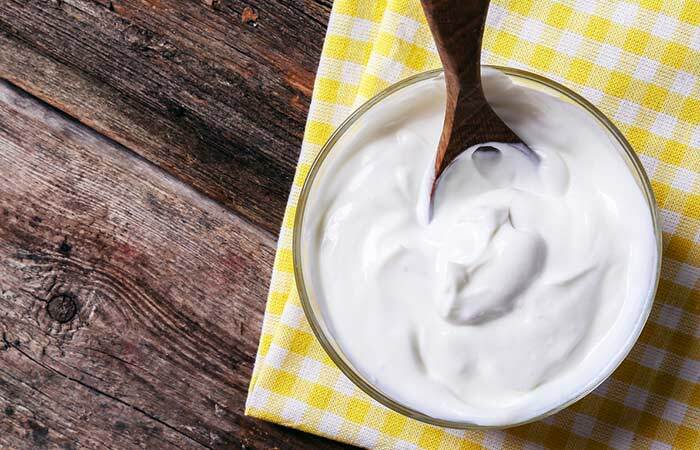 The lactic acid and other natural enzymes present in yogurt cleanse the pores and shrink them. This exerts a tightening effect on the skin, thus reducing the appearance of fine lines and wrinkles. Yogurt also diminishes scars and makes your skin smooth (27). 1. Crush the aspirin tablets and add enough water to make a paste. 2. Apply this on your face and let it sit for 15 minutes. Aspirin is composed of acetylsalicylic acid, which unclogs pores and also shrinks them. This chemical possesses exfoliating properties as well. With regular application, it exerts anti-aging effects on the skin by reducing fine lines and wrinkles (28). If you have dry skin, this remedy can dehydrate your skin further. Moisturize your skin well after each application to avoid any dry patches. Cut the tomato in half and dip the inner half in sea salt. Scrub your face with this for a minute or so. Leave the tomato pulp that has oozed out onto your skin on for 5 minutes. You can also include tomato paste in your diet for better results. 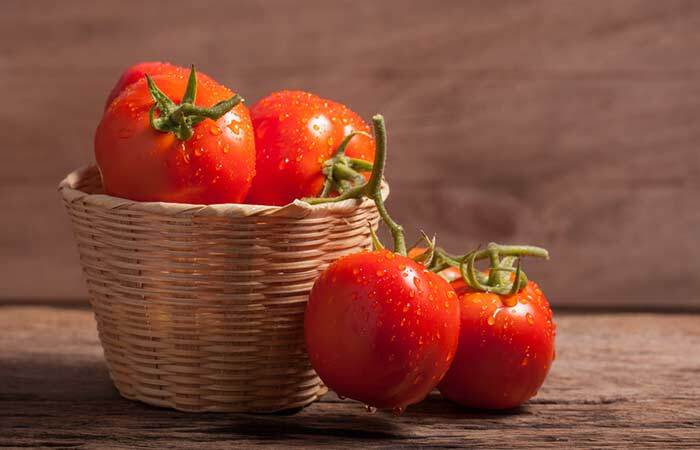 Tomato is rich in beta-carotene and lycopene that reverse the damage caused by the harmful sun rays. Fine lines, wrinkles, age spots, and freckles can all be reduced and lightened with this tomato mask (29). Grind the radish seeds using a mortar and pestle or a dry grinder. Apply the radish seed paste on the affected area and leave it on for 20 minutes. Gently remove the mask with lukewarm water. Radish seeds are commonly used to get rid of blackheads and freckles. 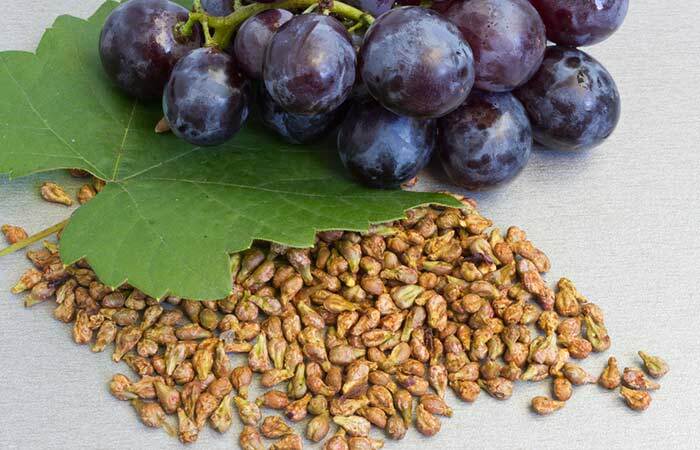 While their use in the cosmetic field is already well-established, very few know that these seeds can also be used for anti-wrinkle treatment. They contain saponins, tannins, and phenols that possess healing properties (30). 1. Soak the almonds overnight in the milk. 2. Remove the almond peels in the morning and grind along with the milk they were soaked in to make a paste. 3. Apply this on the face and let it dry for 15 minutes. Do this twice a week for young and healthy skin. Almonds contain vitamin E that restores the natural elasticity of the skin. 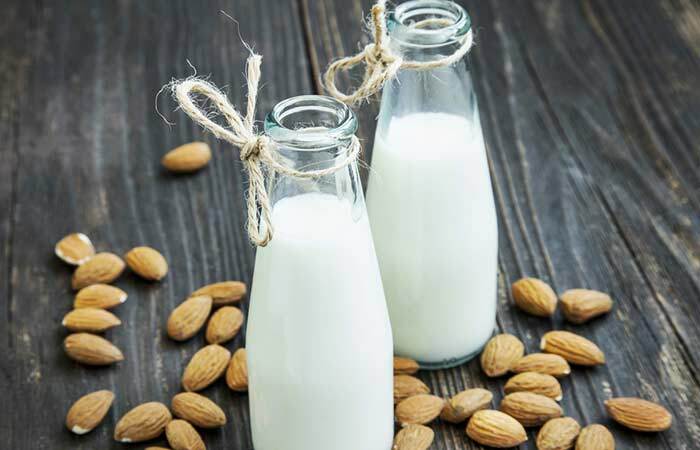 Along with the milk, almonds moisturize the skin and make it soft and glowing (31). Juice a celery stick or two and add it to the oatmeal. Mix well. Wet your hands and gently scrub the pack away in circular motions. Use this as a face mask/scrub up to twice a week. Celery is very high in water content and is excellent at rehydrating the skin. It also contains minerals like magnesium and potassium, and vitamins like A, B1, and B6 that nourish the skin. Acne scarring is a common ailment for which celery face packs are used. The same healing properties of celery can be used for reducing wrinkles (32). Grind the leaves with some water to get a smooth and even paste. Apply the fenugreek paste as a face mask and let it dry for 12-15 minutes. 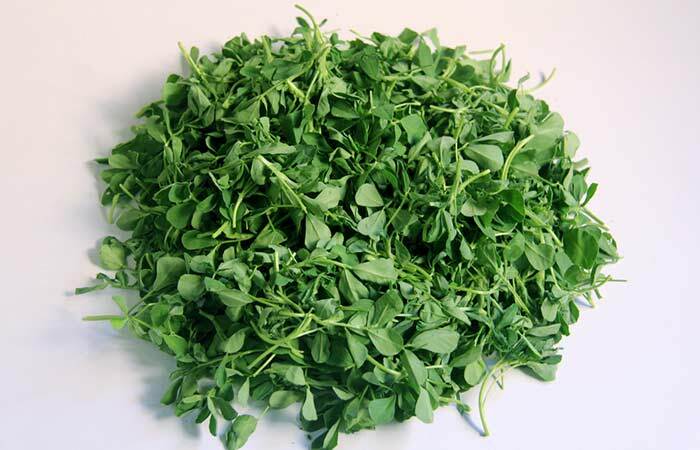 Fenugreek leaves are often used to treat skin disorders. They contain many minerals and vitamins that help in reducing wrinkles and fine lines (33). Peel and cut the fruit into small pieces. Grind in a blender to get a paste. Use kiwi as a face mask twice a week. Kiwis rejuvenate the skin as they are rich in antioxidants like vitamin C, vitamin E, and lycopene. They boost the production of collagen and elastin, which are required for a firm and younger looking skin (34). The home remedies listed in this article have been tried and tested by people across the globe. The ingredients in each remedy contain potent compounds that will reduce wrinkles and also make your skin healthy. Include these remedies in your regular skincare routine to get rid of wrinkles and prevent them in the future as well. Apart from these remedies, certain lifestyle changes need to be made to prevent premature aging and wrinkles. Here are a few simple tips you can follow. Nothing can be more effective to ease out those fine lines appearing on the skin. As you sleep, the body goes into the restoration mode and, at the same time, secretes the human growth hormone (HGH). HGH plays a quintessential role in keeping your skin more elastic and less prone to wrinkles. If your body is deprived of rest, it results in an increase in the production of cortisol, which breaks down the skin cells, triggering wrinkle formation. Make sure you sleep on your back. Sleeping on your sides can cause wrinkles on that side to increase. Lighten up, for stress can have adverse effects on your beauty. Stress, along with anxiety and tension, could make your skin thin and weaker and prone to wrinkles. Indulge in recreational activities so that stress does not get to you. Think about all the good things in your life – and smile. A smile will help you beat the stress and banish those wrinkles. Life often springs unexpected situations at you. You need to learn the technique of keeping calm, no matter how challenging or adverse the situation may be. Stay relaxed all the time, and maintain a healthy lifestyle. On an average, an adult is advised to drink at least 1 to 2 liters of water in a day. However, studies indicate that you should drink 5 to 6 liters of water in a day to keep your organs healthy. Drinking ample amount of water helps your body flush out toxic waste. A clean inside reflects on the body outside. Trimming those bangs if you are over 25 is a sure way to help reduce the appearance of wrinkles on your forehead. A quick trim will round up your face, accentuate your features, and reduce wrinkles. Try it! We are not kidding you on this one. Yes, the sun is the most crucial factor that contributes to the generation of wrinkles. The harmful UV rays of the sun are extremely damaging for the skin and deplete it of its natural moisture. The weakened collagen fails to protect the skin from further damage. The risk of skin cancer also increases if you step out in the sun every day without any protection. So, do not forget to use an umbrella or a hat the next time you step out. Non-radical issues, such as pollution, affect your skin the most. Use a scarf if you have to step out for long hours to protect your face from exposure to dust and pollution. Cleanse your skin with a mild face wash replenished with antioxidants for dirt, grime, and wrinkle-free skin. As mentioned above, extensive exposure to the sun damages the skin beyond repairable levels. Studies suggest that while vitamin D is a blessing to the skin, exposing yourself to the ultraviolet-rich sun rays for a long time does more harm than good. It accelerates skin aging, resulting in the early onset of wrinkles. Be liberal while using sunscreen. Opt for a sunscreen that has high SPF. Also, choose a product that is water-based and does not contain harmful chemicals. Apply it even during cloudy days. Apply it at least 15 minutes before your tryst with the sun, and reapply every 4 to 6 hours. Apart from being hazardous to your health, smoking can also cause wrinkles. The carcinogens in cigarettes act as a toxic plastic bag around your pretty face, blocking and depriving it of oxygen. This exaggerates the pace with which wrinkles appear on your skin. So, say goodbye to smoking. It may sound stereotyped, yet, you should quit alcohol as soon as you can. If you are unable to resist alcohol completely, you should set a limit on the intake. Strange, but true. Wrinkles can be the result of several genetic factors. In some families, people look aged in their mid-40s. On the contrary, in another family, the members might look young even in their 70s. Therefore, you should consider the genetic factor as far as wrinkles are concerned. However, it does not necessarily imply that genetically driven wrinkles cannot be removed. You can still get rid of them with proper skin care. This ancient Chinese method of healing and treating multiple ailments seems to have a solution even for wrinkles. Tiny acupuncture needles are inserted at different points to reinstate a healthy flow of energies. This causes the body’s fluids to flow freely and perform optimum functions. Facial acupuncture also enhances collagen production. Multiple sessions can enhance skin health and reduce fine lines, wrinkles, and skin folds (35). Make heads turn with your young looks. Choose from the best home remedies listed in this article to banish the lines on your face. You must also switch to a healthy lifestyle, which means eating well, sleeping well, following a regular exercise regimen, and being vigilant of your habits. So which of the home remedies for wrinkle-free skin suits you? Do let us know in the comments section below. As you grow old, the need for antioxidants becomes greater. The metabolism of the body deteriorates drastically with age. Weak digestion capacity and a poor metabolism are often responsible for the weakening of the skin. Therefore, add a lot of antioxidants to your diet for improved results. This translates to plenty of fruits and vegetables that are rich in vitamins and minerals. Consuming foods rich in vitamin A can take you one step closer to your dream skin. Fruits such as papaya, vegetables such as spinach, roots such as carrot, beans like soybeans, and fish are great sources of vitamin A. This wonder vitamin will retard the aging of your skin and keep you looking young for years. Vitamin E is another component that keeps your skin firm and refreshed. Eat spinach, turnip greens, kale, Swiss chard, almonds, avocados, shellfish, fish, and olive oil. Grains such as buckwheat and wheat germ contain collagen-enhancing compounds. Pro-inflammatory foods such as fried foods, processed foods, dairy, and sugar need to be avoided or kept to a minimum to prevent wrinkles. What Age Do You Get Wrinkles? The skin usually starts to show the signs of aging between the ages of 30 and 35. But, with the current environmental pollution and stress factors, premature aging with fine lines and wrinkles in the 20s is also common. According to dermatologists, fine lines are one to two millimeters in depth. Any line deeper than two millimeters on the skin is regarded as a wrinkle. Should You Stop Smiling To Prevent Wrinkles? If you are considering stopping smiling to prevent wrinkles, you might as well not have any facial expression at all! Enjoy your life and smile as much as you want to. Just take good care of your skin and maintain a healthy diet. Laugh lines or wrinkles around your mouth in old age only indicate the happy life you have had. Do not let wrinkles stop you from enjoying your life. Can A Massage Help Melt Away My Wrinkles? Regular massage, be it on the face or the body, increases blood circulation and relieves stress. This, in turn, keeps your skin glowing and firm. Use a simple oil such as olive oil to further enhance the benefits of the massage. You will also be moisturizing your skin at the same time. Does Moisturizer Get Rid Of Wrinkles? Dry and dehydrated skin can easily develop fine lines and wrinkles. Using a good moisturizer or an oil (that works as a skin moisturizer) on a daily basis will ensure that your skin is well hydrated and nourished. This reduces the chances of developing wrinkles. Regular usage of natural moisturizers with potent anti-aging contents such as olive oil, almond oil, or coconut oil can help you reduce the already formed wrinkles in a couple of weeks.